Fireworks forever if we win the World Cup! So will there be World Cup Fireworks….. If we switched from being a fireworks company to a waistcoat company we’d be quids in this week! With England basking in unexpected World Cup success, our coach Gareth Southgate is elevated to national hero. 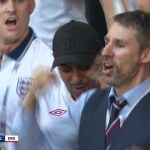 The England manager has even been promised a lifetime supply of waistcoats from a firm in London. So, if England win the World Cup, we’ll match that by offering him a lifetime supply of fireworks! We’ll name it the annual Sir Gareth Southgate World Cup Fireworks Display and donate all proceeds to charity. No matter how England progress from this point, we can all be proud. There have been celebrations all over the country, with the team continuously exceeding expectation. Cathedral organs belt out football anthems and the country prepares to shut down for Wednesday’s semi-final. All of this unfolds as Gareth’s waistcoat takes on cult status! 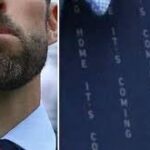 One of the funniest images from Saturday’s quarter final was the lookalike in the crowd, sporting the waistcoat, the suit and the beard! The newspaper headline writers are also having a field day. “Southgreat” trumpeted the Sun on Sunday. “Cry God for Harry, England and St George!” said the Sunday Telegraph. For some, World Cup fever appears to be at it’s highest in living memory. As we bask in a long summer heatwave, the nation is starting to believe the team can not only reach but win their first final since 1966… and what better way to celebrate than with fireworks! Already our phones are starting to ring with orders for rockets, roman candles and especially our ‘display in a box’ fireworks where you light one fuse and get a great fireworks display last several minutes. We are also at the ready for professional displays where we come and do it all for you. Our teams are primed for a 24-hour call-out service so we can be there to light up the sky. Call us on 01582 485555 or email [email protected] to set the ball rolling.